Buggenhout (Dutch pronunciation: [ˈbɵɣə(n)ɦʌut]) is a municipality in the Belgian province of East Flanders in the Denderstreek. 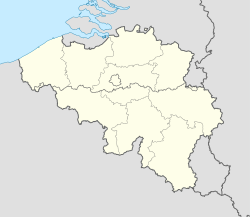 The municipality comprises the towns of Buggenhout proper, Briel, Opdorp, and Opstal. On December 31, 2013, Buggenhout had a total population of 14,444. The total area is 25.25 square kilometres, which gives a population density of 572 inhabitants per square kilometre. The current mayor of Buggenhout is Tom Van Herreweghe, from the (local) NCD party. Buggenhout is also known for its forest, the "Buggenhoutbos", which is the largest forest of East Flanders. The geographic centre of Flanders lies in Opdorp. Buggenhout has two breweries, Bosteels Brewery (known for the "Tripel Karmeliet", "Deus" (a champagne beer), "Kwak") and De Landtsheer, now called Brouwerij Malheur (known for "Malheur"). The original meaning of the name is "beechwood" or "beech forest" (in modern Dutch: Beukenhout). The name is derived from the Middle Dutch Bucghenhout from Old Dutch Bukenholt. Buken comes from Proto-Germanic *bokjon (Modern Dutch: beuken, Old English: becen (beechs)), holt from *hulta (Modern Dutch: hout (bos), Old English: holt (forest)). Buggenhout still contains a small forested area called Buggenhoutbos. This page was last edited on 27 July 2017, at 08:11 (UTC).